Roger Becker is past-president of our local AAW chapter and we've known him for about fifteen years. Roger is an active turner, doing many craft shows and has work in a number of galleries. 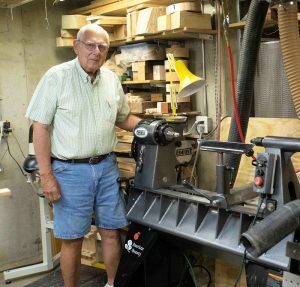 He and his wife Jackie are both active carvers, and their Santa Claus figurines at Christmas time are a must-have gift. Roger hired some husky movers to get his American Beauty into his well equipped basement workshop. 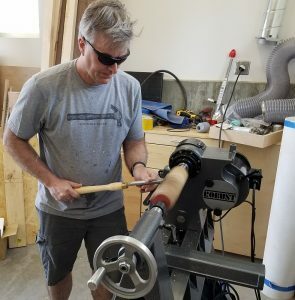 Jim Blais hails from Michigan and shared this comment with us: My new Robust American Beauty lathe has made its way to its new home! I’m really impressed with it! Please thank your all of your Associates that played a part in its production and shipping. Andrew Rothwell from Nevada and his new American Beauty. If you'll forgive the modified saying, "his turning is so bright he needs to wear shades!". 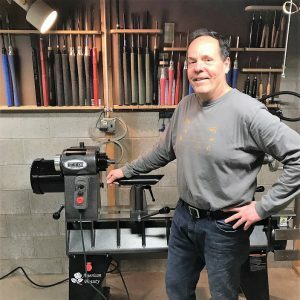 Ralph Benson, our dealer in Reno, assisted Andrew with the sale and delivery.